More than 125 students are taking part in the Healthy Youth Relationships symposium to learn what's acceptable and what's not when it comes to dating. For teens who are just starting to date, it can be difficult to tell when a relationship has crossed the line to become an unhealthy one. That's part of why, the Canadian Red Cross says, young people from 15 to 24 are at the greatest risk of experiencing dating violence — and why the organization's Healthy Youth Relationship program aims to teach young people what's acceptable and what's not when it comes to dating. 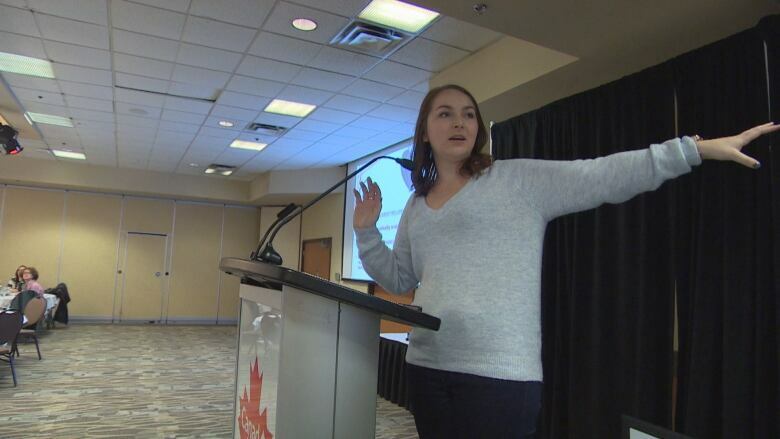 The Red Cross started a two-day symposium on healthy relationships for Manitoba high school students on Wednesday. 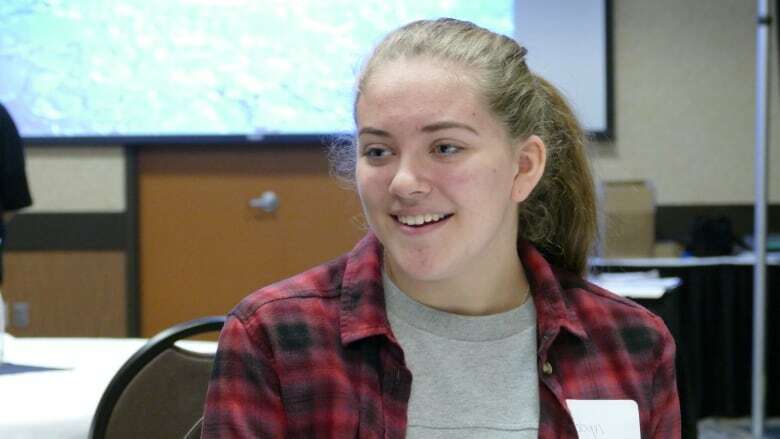 Robyn Klein, a Grade 10 student at the school, was among the teens from schools across the province who attended the symposium at Canad Inns Polo Park. "You see a lot of [couples] in the halls," said Robyn Klein, who is a Grade 10 student at Murdoch MacKay Collegiate in Winnipeg. While the 15-year-old said she hasn't started dating yet, a lot of her friends are in relationships. "They come to me with their problems and I try my best to help and whatnot," she said, admitting she doesn't always know what to say to make them feel better. That's what she hopes to learn at the symposium, where more than 125 students, from grades 7 to 12, will be trained as peer facilitators, and can then share what they've learned with their schools. "It's hard to recognize when you are in an unhealthy relationship," said Mallory Shack, who runs the Red Cross training. "I think for young people it's just giving them the tools up front to be able to know when to recognize when their relationships are becoming unhealthy." It's a problem that may be more common than many adults realize. Shack said 64 per cent of 11 to 14-year-old respondents in an online survey said they knew some who had been called "ugly" or "stupid" by the person they were dating. The first day of the healthy relationships training focuses on personal boundaries and understanding how people deserve to be treated by a romantic partner, Shack said. Day 2 looks at dating violence, including emotional, physical and sexual. Warning signs, she tells students, include "If your partner starts to ignore you, if they start to make you feel bad about hanging out with your friends and family, if they start to show physical signs of hurting or harming you, if they start using inappropriate language like swearing or yelling or shouting." A big part of the training is recognizing the signs of trouble in friends, and how to intervene and help. Rhianna Holter-Ferguson, a 22-year-old Red Cross volunteer, went through a similar program when she was in high school. She became a peer mentor and said it helped her learn how to better connect with her friends and classmates. "[It] just made me more aware of what other people are going through. I kind of see the signs more and I know when I feel comfortable to step in and provide assistance if I can," she said. She thinks the peer mentoring model is best, because teens don't always feel comfortable going to a teacher or adult for help. Klein said she is excited to step into a peer-mentoring role at Murdoch MacKay. "I feel like it's really important because we are still developing and we're still growing up," she said. "Not a lot of people know exactly what, say, consent means — and so coming to this [symposium], I am sure you will be able to learn what that is better, and just know how to properly treat someone in a relationship."